After completing a few great workouts while taking Essential Amino Energy by Optimum Nutrition as my pre workout supplement of choice I feel like I am ready to do a full review on the product and recommend it to others. Effectiveness Review – Amino Energy is a new favorite pre workout supplement for me as I found it to be very effective without any downsides at all. With the energy coming from an energy blend of caffeine, green tea extract, and green coffee extract I felt great with no jittery-ness and no crash after my workout. I took Amino Energy for a few workouts before the weekend and I felt great in each workout. I had high energy throughout my entire workouts, and felt like I could perform exercises with more weights or for more reps than I had been without Amino Energy. Because I was working out prior to leaving for Vegas on the weekend I wanted to make sure that my energy wasn’t coming from wanting to get some solid workouts in before I left. I returned from Vegas on Monday and took 3 scoops of Amino Energy before today’s workout and again felt great throughout the whole workout. I actually completed more reps on a few exercises than I did before I left, and that was after a weekend of not eating too clean and having a number of beers and mixed drinks. Overall I think Amino Energy is VERY effective. Taste Review – I ordered Blue Raspberry and Fruit Fusion, but have only opened and taken Blue Raspberry so far. 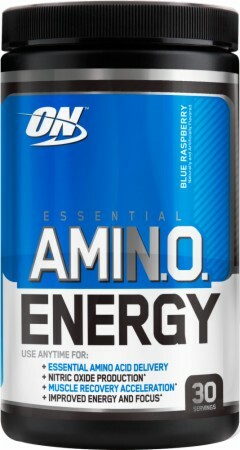 I love the taste of the Blue Raspberry Amino Energy and would rate it a 9/10. Fruit Punch flavors are usually my favorite so I’m excited to give the Fruit Fusion a try. I probably won’t open it until I finish my Blue Raspberry container, but I will update this taste review when I try it out. Two thumbs up for taste – love it! Price Review – The cost at BodyBuilding.com for the bigger 65 serving container is $38.99. You can also get the 30 serving container for $19.99. These prices are far cheaper than what you would pay in a supplement store like GNC. 2 Scoops = 1 servings with Amino Energy. It recommends you take anywhere from 2-6 scoops (1-3 servings). I’ve been taken 3 scoops and feel great after the 1.5 servings, but I usually am on the lower side of servings for all pre workout supplements because it doesn’t take much for a stimulant to give me the energy I need. Start with 2 or 3 scoops and then you can work your way up. If you are taking 2 servings pre workout you will get just over 30 workouts in with the bigger container. You are looking at about $1 per workout, which I think is a great value for how good of a product Amino Energy is. Because the formula also has Amino Acids and Beta-Alanine in the formula you will save money from not having to buy those two supplements separate. Overall great value on the price. Ingredients Review for Amino Energy – One serving of Amino Energy includes a lot of great ingredients whether you are a man or woman, trying to lose fat or gain muscle. With one serving of Amino Energy (which is 2 scoops) you will get 5 grams of amino acids, 100 mg of caffeine for energy, as well as beta-alanine, green tea extract, and green coffee extract. I recommend a little more than 5 grams of amino acids around your workout, so I will be running Amino Energy with at least one scoop of PVL Instant BCAA (any BCAA product would do). You may also want to take some beta-alanine separately. They don’t state how much beta-alanine is in their formula but I would expect it to be less than the 5 grams recommended daily. You may need to run Amino Energy with some other supplements if you want the most gains in the shortest amount of time possible, but for the price Amino Energy is a GREAT value and an overall great pre workout supplement. I would highly recommend Amino Energy to anyone looking for an energy boost for their workouts. If you read this review and purchase the product I would love for you to leave a comment below letting me know how you liked it! I got the fruit flavor free off optimal nutrition site when i purchased a load of protien. I do cardio then my split routine and i feel great. I finished this and wanted to try something new so bought gaspari superpump max. This makes me feel ill probably due to the creatine mono in the ingredients.